Tenkar's Tavern: So, Where's That Gygax Memorial Fund Audit? It's been five weeks since I last poked the Gygax Memorial Fund. Its overdue. Now, back in June, the 2015 Tax Return for the GMF was posted. Prior to that, Gail had stated that after the 2015 tax return was filed, she would have an audit done. So, we have been waiting at least 4 months for the results of that audit. Of course, 2015 was the first year the Fund had it's net worth decrease, not so much because of large expenses but simply for lack of monies coming in. As the Fund only took in $566 in 2015, just the cost of running the Fund was nearly twice its income. 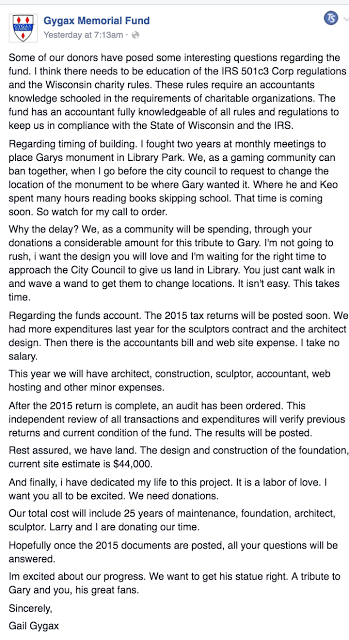 Judging from the lack of updates, I'm going to guess the Fund will not incur any construction or sculptor expenses for this year. I hope no one is seriously waiting on Gail's "Call to order." Not that you'd hear it anyway. The GMF rarely updates. I do not care anymore. It is her money and she can do with it as she pleases. There is nothing anyone really can do about it. Actually, it isn't "her" money by any stretch of the imagination. You may be confusing the fund for the trust. While that is true, it's still her charity, it's not like the government either, nor is it a Kickstarter with those types of expectations. the Fund's expenses are minimal. Assuming they are what they are, it really shouldn't be that time consuming. It may not be time consuming, but it might be a formal process to undergo that has to be scheduled, just like a legal filing can take months to go through. And it might still be expensive. But in all honestly, what extra insight will an audit give? The amount of expenses are very minimal and reasonable for a very small non-profit organization. It is a bit odd that they seem to be keeping it in cash. An endowment of that size could be earning a low salary if they'd bothered to invest it in reasonably liquid assets (index mutual funds aren't exactly complex derivatives). Even a money market account would have at least covered their modest expenses. Index funds carry too much risk for market loss and wouldn't be good. That is some very serious Dunning-Kruger effect going on there. You probably actually believe that statement to have value beyond showing that you need a trustworthy financial professional to go through your portfolio. even a return of 1% would cover their expenses most years. my understanding is that their accountant is very qualified. how the fund isn't earning a minimal return is very surprising to me. it is literally throwing away money. Obligatory "waiting for Spider-Man to swoop in 'like a stream of light, he arrives just in time.'" post. A timeline on the memorial. Is that the goal?